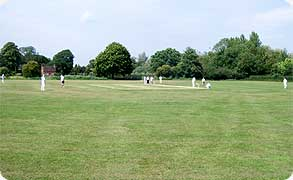 In 1948 Major Godfrey Edward Miller Mundy of Red Rice donated just over 5 acres situated between Goodworth and Upper Clatford to the Parish Council for use as a sports and recreational venue. Thanks to the recent practical and financial support of the Upper Clatford Youth Football Club and the Upper Clatford Cricket Club the Pavilion has been modernised and a Car Park have been added. The Pavilion has changing rooms for home and visiting teams and there are hot and cold showers and a kitchen. From 1st September to 30 April Upper Clatford Youth Football Club have priority use of the field which limits other teams making use of it, however if you are interested please contact the Clerk or Cllr David Coole. 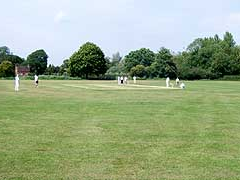 In the summer the cricket field and pavilion are now available for hire separately or together on a daily or longer basis if required. NO DOGS. Please note this is a childrens play area and like both Anna Valley and Balksbury Bridge Playing Fields no dogs are allowed.